Wednesday I woke up earlier than usual for a conference call with our collaborators back in the states. Our payload has come northward quite a bit in the past day or so. At the end of our McMurdo monitoring shift last night, the balloon had just barely reached 85 degrees south, the furthest south that Google Maps bothers providing any data. 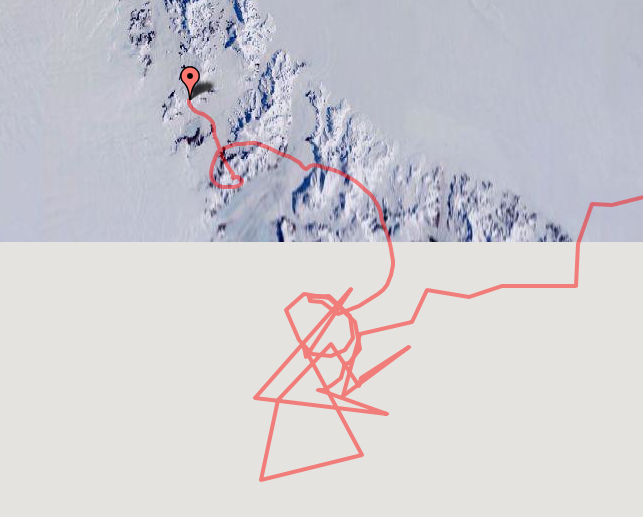 This morning, Super-TIGER passed over the Beardmore Glacier, the route taken by Shackleton to the polar plateau and later by Scott to the South Pole itself. The balloon continued to drift north-west over the Trans-Antarctic Mountains for the entire day. Otherwise, life continued as usual here in McMurdo. Thomas and Sean worked out at the LDB site again today. The BLAST payload recovery team has been hoping to get out to BLAST this week, but every day so far there have been weather problems either here or there. I went for a quick hike around the Observation Hill loop. About halfway through, I heard a squawking noise, and turned around to see a skua heading right towards me. Since interfering with the wildlife is forbidden under the Antarctic Treaty, I stopped walking until the skua flew away. Once it was gone, I took out my camera and continued walking. I walked about another 30 seconds before the skua decided once again to fly right at me. Again, I froze, but this time I snapped a few photos as it went by. I waited around for about five minutes, and then continued on, having seen no sign of the skua after that. Out of Focus Angry Skua! Otherwise, there were just a bunch of seals lying around on the ice shelf lazily. There was apparently a large group of penguins a half mile or so off on the sea ice that Thomas saw earlier in the day. Thomas offered to take over our McMurdo monitoring shift tomorrow night, giving JohnE and I a rare day off. We'll probably head over to Scott Base in the evening for the store (I need to start actually buying souvenirs and stuff now that our time here is almost over) and bar.